Airlines require a large amount of Aeronautical Information and Precise Planning for Safe operations of flights. Collection and processing a data set of this magnitude requires extensive efforts and coordination of multiple departments. Currently, data collection is driven manually which makes it tedious and is prone to human errors. Aeronautical Design Labs (ADL) has developed a unique web based application called AmDaC which is capable of fetching Aeronautical Information from any country's Published AIPs’ after every AIRAC publication date and compare it with the older versions; to create an updated and accurate dataset of latest Aeronautical Information automatically. An AmDaC user can have access to all country’s AIP Amendments on a single platform in a few clicks. 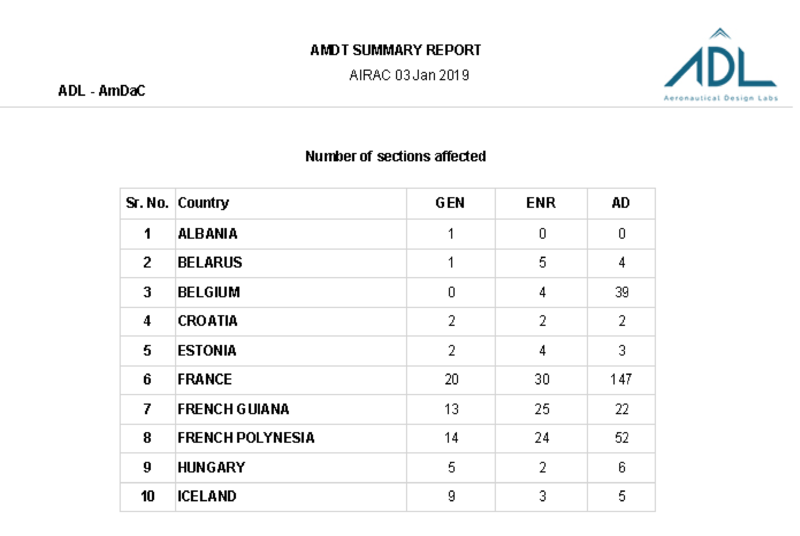 AmDaC also enables its user to keep summarised reports of all amendments with respect to every AIRAC cycle. Alerts & Notifications are provided to the users of AmDaC based on their preferences. AmDaC’s flexibility allows it to further plug into an Airline’s existing Flight Planning Software. Reduction in Efforts, Possible Human Errors, Cost of Operations & Turn Around time. Promoting use of Digital System in line with ICAO’s objective of Transition from AIS to AIM. Copyright © 2018Aeronautical Design Labs All Right Reserved.